We run full-day and half-day departures. All full-day trips begin at either 10:30 or 11:30. They last approximately 6 hours and include a riverside lunch. All half-day trips begin at 12:30pm, are 4 hours long and do NOT include lunch. Take your family, office, church, or scout group rafting on the Deerfield River's most popular rafting section, Zoar Gap. With a minimum age of 7, these Class II whitewater rapids with one Class III rapid are ideal for beginner rafters. Our ten-mile white water rafting trip on Zoar Gap begins at Fife Brook Dam in Florida, Massachusetts. Rapids such as Microwave, Freight Train, and Pinball allow crews to hone their skills in preparation for the exciting class III whitewater of Zoar Gap. Below the Gap, we pull over in a state forest for a delicious picnic-style lunch with homemade salads, sandwiches, and cookies. After lunch there are opportunities to swim or simply relax as we raft back to our basecamp where hot showers and a slide show of the day's adventure await. "It was a good mix of just enjoying floating on the river and exciting rapids. It was my first time, so I was a bit nervous, but it turned out perfect. It was also exciting enough to satisfy my 2 teenage boys who came along! Very well run, on time, organized, fun but safe! Staff was great." - Terese R.
"We had an awesome experience and cannot say enough good things about our adventure. We are looking forward to stepping it up to level 3 and 4 whitewater next summer. We felt safe and secure at all times. All anxieties were put to rest prior to stepping into the raft!!" - Karen O. "This memorial day weekend I took my third trip with Zoar. All of those 3 trips have been the "Zoar Gap Trip", with different groups of people, it has always been a crowd pleaser and I would do it again when entertaining out of town guests. This trip over memorial day weekend was colder and rainier then we had expected, but the staff still provided a great time. One of these days I hope to get a chance to do the Dryway and Zoar will be my first choice." -Kathleen C.
Expect everything you bring with you on the raft to get wet! In warm summer weather, some guests are comfortable in bathing suits/swim trunks or light layers. However, we ask you to not wear cotton, as it will keep you cold and wet throughout the trip. Guests are not allowed to wear jeans on the river. Wool and synthetic materials such as polypropylene, nylon, and fleece, are appropriate for cooler weather and water temperatures. Wetsuits, splash jackets, and neoprene river booties are available for rental if you need them. You are required to wear sneakers or other shoes that can be secured to your feet. No flip-flops or Crocs! Bring any required medications as well as extra money for souvenirs, coin-operated showers, etc. Before the trip, please leave any and all valuables including money as well as your dry clothes and towels for after the trip in your locked vehicle. Keep your car keys with you during registration, as we will collect those and put them in a lock box before gearing up, then return them to you when you get off the boats. With a minimum age of 7, these Class II whitewater rapids with one Class III rapid are ideal for beginner rafters. More experienced paddlers will find a scenic view of the Deerfield river valley relaxing while still facing a typically technical Northeast rafting day. What is a non-guaranteed day? Since Fife Brook Dam generates hydro-electricity, there is typically raftable whitewater on non-guaranteed release days. However, it is possible that the water release will be too late in the evening or too low of a flow for recreational usage. By booking a non-guaranteed day you understand that we may need to alter the day's itinerary based upon the water release. If we are unable to run the trip or if the scheduled start time changes, we would call you by 7PM the evening before your trip. If you do not receive a call, the trip will be running as scheduled and you should plan to arrive for your trip at the start time indicated on your guest confirmation. Yes! For every 11 people you book, the 12th person goes out for free on the Zoar Gap. This discount applies automatically, so you can make your reservation online, or give our office a call at 1-800-532-7483. Yes! Our photographer will be stationed at the class III rapid taking high quality pictures of each raft. Back at base you'll be able to view your photos in the rafting pavilion. If you'd like, you can purchase the photos of your raft. The Zoar Gap trip meets at our base in Charlemont, Massachusetts, check your confirmation email for the exact meeting time of your trip. Please try to be on time, since we must work within the schedule of water releases decided on by the power company. You will be required to read and sign a release of liability at this time. All guests will be required to wear a Zoar Outdoor issued PFD (Personal Flotation Device) and helmet. You will also be provided with a paddle. 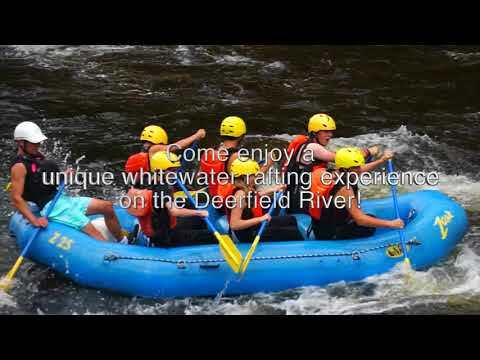 We raft a ten-mile section of class II and III whitewater on the Deerfield River in Northwestern Massachusetts. We put in below the Fife Brook Dam and finish the trip at our base camp in Charlemont, MA. The trip usually takes 6 hours, including registration, transportation to the river, swimming stops, a picnic lunch served on the river, and a slide show of your run through the biggest rapids. This trip comes with a picnic-style lunch, and a spread of chips & salsa, hummus or black bean dip, sandwich fixings with choices of cold cuts and cheeses, as well as lettuce, tomato, condiments, and dessert and a drink. From April 1st to May 15th and September 15th to October 15th, this trip comes with a side dish of vegetarian soup or chili. In the warmer season from May 16th to September 14th, the side dish is usually coleslaw, or a pasta or bean salad. Lunch on this trip may sometimes be served later in the day due to water release times, weather, or other factors beyond our control.